This collection is one of our most beautiful to date, and has also been one of the most interesting and fun to work on. When creating a new design, it’s often a particular drawing or painting technique that inspires themes and designs and this was certainly the case for the Tattoo collection. Using bright inks and a rotary pen allowed for detailed and intricate designs, reflecting the technique found in tattoo art. The focus on floral and natural designs fit the technique perfectly. The collection focuses on fluidity and movement and a bold colour scheme. We created a vibrant colour palette using ink with an initial focus on shades of blue and red, inspired by Japanese embroidery and antique kimonos. In particular, a kimono with embroidery that meandered down the front and back to allow a migration of the design. The intricacy found across traditional Japanese hand embroidered robes is fascinating, creating beautiful designs that are bold, daring, and make a statement –everything the Tattoo Collection aspires to be. 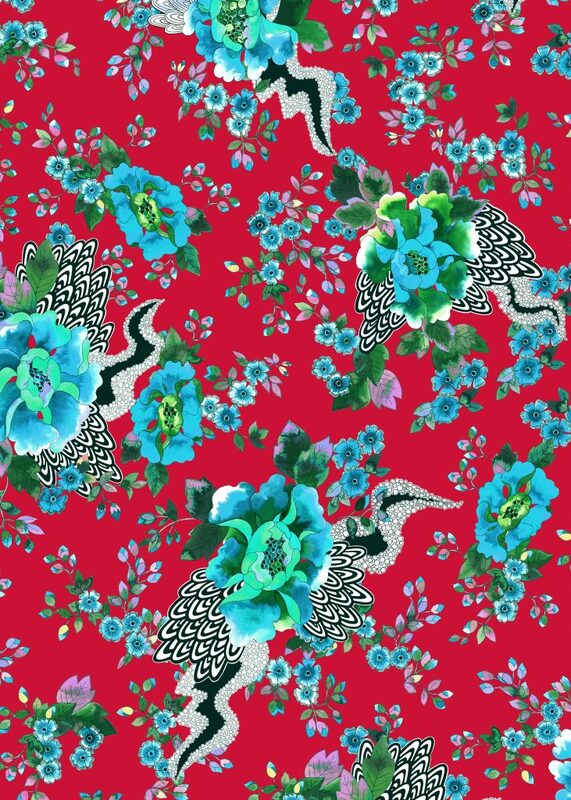 The ideas of a pattern moving through fabric as opposed to simply acting as an all over print was very inspiring. This fluidity and movement was also evident in many of the early works of Alexander McQueen, specifically when considering the chain-fringed evening gown made for Givenchy as part of the S/S haute couture collection in 1998 and his Savage Beauty gown for S/S 2001 where he explored motion using metal scales and chain-work. Manipulating heavy and industrial materials to appear soft and feminine inspired thought into how a subtle flow could be expressed across a print, especially when using the block colours transferred from Japanese kimono art. Differentiating from previous designs, the Tattoo Collection is part of a collaboration with Sharon Cunningham who played an important role in transforming my vision into a reality. Having already experimented with using similar prints for pocket squares, I was interested in working across a larger scale. As a pattern cutter with a great eye for shape and construction, Sharon was involved in frequent discussions about my sketches and ideas where her advice and opinions helped the collection to really prosper. Her toiles were beautiful and we worked together in adjusting designs and improving them so that they could encapsulate the collection perfectly across key garment pieces. 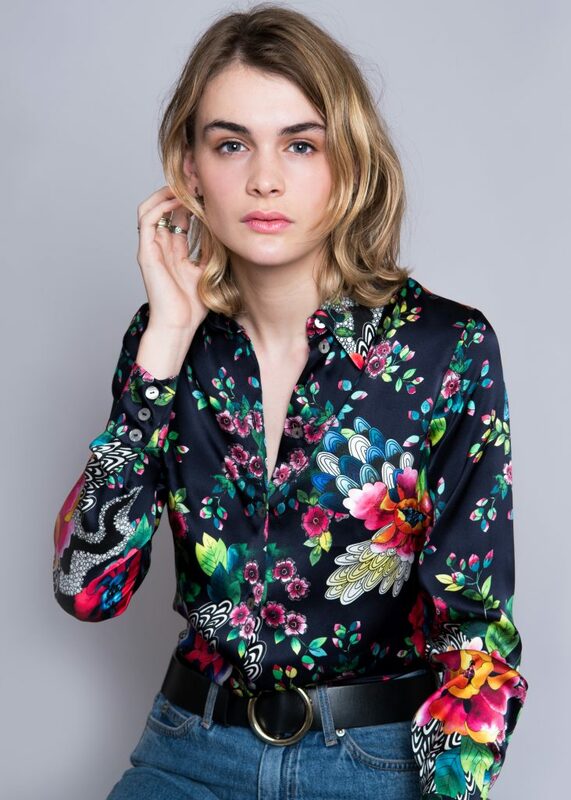 Some our our favourite pieces include the D’Arblay shirt and Lexington dress in the hero print. Having named each piece after the streets surrounding a tattoo parlour on D’Arblay street, this collection feels really personal. It reminds me of one of my first jobs for the English National Opera and the time I spent in Soho, collecting fabric samples for costume designers. official Pinterest is full of ideas and images that will give an insight into what makes us tick.